Is your morning routine chaotic, rushed and mentally, physically and emotionally draining? If so, you’re definitely not alone! New parents often struggle to establish a calm, organized and positive routine. When you’re running on little to no sleep, even the smallest things can start to take their toll on your happiness and wellbeing. However, there are ways to turn it around. Starting the day off right can positively impact your entire day. 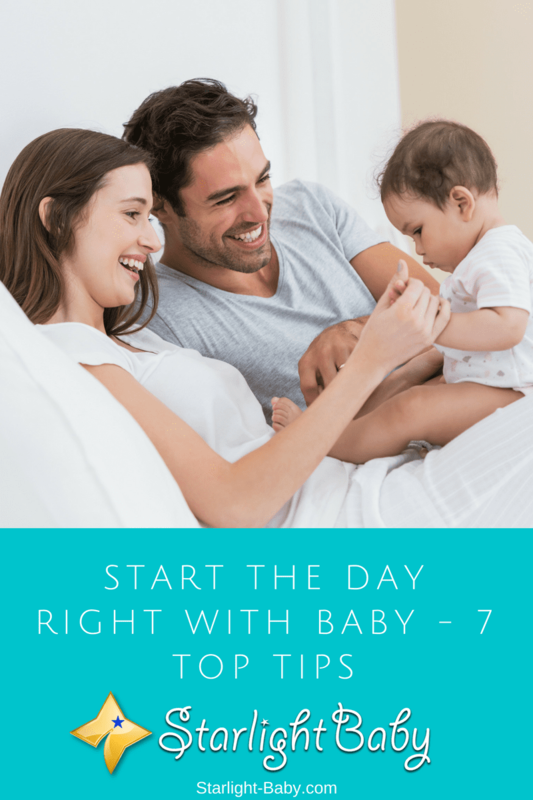 So, here, you’ll discover some top tips to help you start the day off right with baby. When you’re barely getting enough sleep as it is, the thought of waking up earlier might seem ridiculous. However, by getting up even just 15 minutes earlier, you’ll be surprised how much of a difference it can make to your day. Getting up before baby does, gives you the chance to have a little “me time”. Use it to enjoy a cup of coffee, read in bed or simply enjoy the silence to prepare the mind for the day ahead. If you’re already struggling to function due to a lack of sleep, you can try getting into bed a little earlier the night before. That way, waking up a little earlier isn’t going to rob you of even more sleep. Not everyone is a breakfast person, but as a new parent, you need all of the energy you can get! Therefore, you should never skip breakfast if you want to start the day off right. It doesn’t have to be anything huge. A slice of wholegrain toast, yoghurt and fruit, or a small bowl of porridge oats is enough to get your body fueled for the day ahead. It’s not just food you need to focus on either. Hydrating the body first thing in a morning can give you a lot of additional energy. Try placing a glass of water by your bedside the night before, then drink it as soon as you wake up in the morning. This small, simple habit can really boost those energy levels! Once you’re fueled and ready to go, try and spend a little time each morning snuggling baby before your day begins. This gives you chance to bond with baby and simply enjoy the little miracle you’ve created. Babies love to snuggle and just one little smile from your baby can make the day seem so much brighter. You don’t have to wait until you’re stressed to benefit from taking a few deep breaths. Focusing on your breathing, even for a minute or two, helps to center the mind, bringing with it an instant calm. We spend so much of our time living in either the past, or worrying over the future. So, practicing living in the moment is going to be really beneficial to your happiness and wellbeing. It will also really help to prevent yourself from becoming overly stressed throughout the morning. If you don’t find deep breaths on their own useful, you could also try to create your own positive mantra. You can repeat this mantra to yourself mentally as you take each deep breath in or out. Music is well-known for its mind-altering benefits. The right music can uplift the spirit, calm the mind and make you feel much happier. Therefore, it’s recommended you spend even just a few minutes each morning, listening to your favorite music. You could even have music on in the background while you go about your regular morning routine. It’s simple, but an extremely effective way of making the mornings a lot calmer and happier. You could even make playlists dedicated to mornings and make music a daily ritual. Another way to relax and have a more positive start to the day is to play with baby. Taking 10-15 minutes out purely to play with your little one can be a joyful and stress-busting experience. Play games such as Peekaboo, make silly faces to try and make them laugh, or tickle baby (if they haven’t just been fed). The baby stage goes by so quickly so taking as much time as you can to stop and just enjoy your little one is essential. When they’re older, you’re not going to regret not getting those dishes done, but you may regret not taking more time out to just enjoy being with baby. Another thing that’s going to help you start your day right is exercise. I know what you’re thinking – where am I possibly going to find the time and the energy to exercise in the morning? It sounds ridiculous, but the truth is even a 10-15-minute exercise session in the morning can make the world of difference. You could even combine it with nature – something else which is often recommended as a way to start the day off right. Taking time to appreciate nature and everything around us, can really help to put things into perspective. So, why not either sit out in the yard or go for a very short walk with baby and just enjoy the fresh air, nature and exercise. Of course, exercise does more than just start the day off right – it also helps you to get better quality sleep. Not only that, but it’s renowned for its mental benefits, helping to combat symptoms of depression and improving your overall health. So, if there’s just one change you make from this list, resolving to exercise more should definitely be it. These are some of the best ways you and baby can start the day off right. It’s so easy to get absorbed in the dramas of yesterday and stressed out over the chores and responsibilities of today. However, taking the time to be fully in the moment and appreciate your baby can help to put things into perspective and make you feel happier and more relaxed throughout the day ahead. If you follow the tips above, you’re guaranteed to have a much better, calmer start to the day. I find all these tips listed and discussed in this article to be very helpful with how one gets his or her day rolling just fine. I will only comment on the tip of listening to music because I find it very useful when one is doing lots of work. It helps me keep calm and relax when I have stockpile of task to take care of and with the music playing in the background of my working station, I would realize when I have completed my task. Also taking deep breaths helps out when one is stressed. Thank you for the lovely feedback, Martinsx. Like you, music also gives me some sort of therapy on a busy day. I listen to music every day to get some relaxation. It’s true that being a parent might not been an easy task especially when the child is still at the early stage of life, but following these tips such as waking up earlier before the baby does can give the parents a time to prepare themselves as regards making the baby feel relaxed whenever he/she is awake. Playing with the baby every morning for some minutes is another great tip that I picked out that have helped, talking from the experience of parents and their babies around my hood, to bring a better bond between the parents and the babies as well. @Henrywrites You are absolutely right on point how good it is to always play with your baby in the morning before heading out. Babies are little angels in disguise, you can notice they are always joyous anytime you look at them – their faces. They are only sad when they are hungry or ill, apart from that, they always smile. So playing always with them seems to transfer such joy in them to the parent who goes out with them, and likely to have a wonderful day because of the baby’s touch. I always fall in love with kids that smile a lot and in most cases, I can’t help but to carry them up and play with them a bit before I set off for the journey of the day. Making the kids smile is necessary for enhancing their social skills right from that little age. I would say most people are unable to resist a baby’s smile. It could melt even the hardest/coldest heart sometimes. Remember “Maleficent”? haha… Well, it’s just a movie but I know some seemingly tough people whose hearts melted when they had babies. Some people’s lives change because of babies. These tips are very helpful especially to those coming newly to the parenting terms, that’s if they work towards it and follow it accordingly it will help, I have seen new parents who had control of things perfectly; I asked them what was the secret about it and they gave me something to think about. “The lady was like, handle everything about the baby like it was your last, the male should also help too, then you won’t have stress about nothing at all. This word should be like a badge to new parents, it will show them the art of controlling things. And yes, both parents should help in raising the baby. Raising a child is a teamwork from both parents. Our baby is 8 months old. We don’t wake up by ourselves, it is the baby who wakes us. The baby needs the nappy change, he needs food. Therefore, the baby wakes up early in the morning, sometimes at 4 or 5 am. When the baby begins to make a fuss we an no longer continue sleeping. We go to bed early so that we are able to wake up early. Yes, that is true. Babies tend to wake up really early so you’re doing the right thing by going to bed early. Otherwise, you’ll be lacking sleep and feel sluggish throughout the day. Lack of sleep or sleep deprivation is really a problem at times.